It is by Fiorella Design via A Pina Colada. i love this kitchen! everything about it just makes me smile! btw im a new follower, great blog! I adore those tiny pots! S W O O N! Love that kitchen! yep. this kitchen is perfect. Colored subway tiles that go up to the ceiling? You're right. Totally dreamy. Oh, yeah, it's a dream! wowza. when can i move in!? Beautiful!! I think it's definitely the fabulous green tiles that make this kitchen special - and the arch of the window. When I redid my kitchen I also used white marble, apron sink and custom white cabinets - so classic! This kitchen is fantastic. I love everything about it. 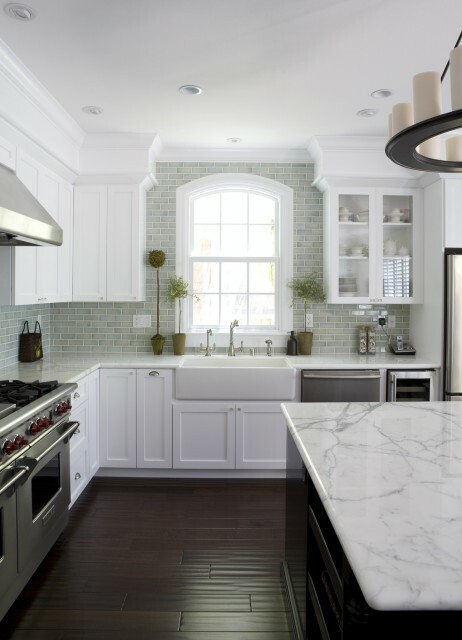 I love brick-style walls contrasting so well with white cabinets. And the floor is just the right shade of dark. Perfect kitchen! Wow, this is exactly the kitchen I've been dreaming about. I'm wondering what kind of tiles those are. Any guesses where the tiles might have come from? Such a great space! I want to know where to find those tiles, I just LOVE them. I've got kitchen refinishing fever! Thanks everyone! I designed this kitchen. The countertop is carrara marble and the backsplash is Mizu by Walker Zanger.